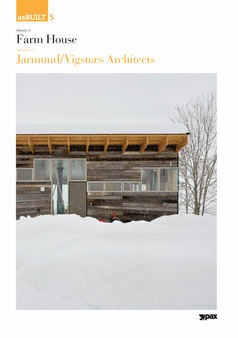 Farm House at Toten (2008), a few hours drive north of Oslo, by Jarmund & Vigsnæs exhibits a rare meeting between architecture and the vernacular. Low budget, within Norwegian standards, this single-family house is both contemporary and traditional. It replaces the main house at a typical Norwegian tun, with several buildings with various functions around a small courtyard, and re-uses the panels of the old barn as cladding with a surprising aesthetic and architectural effect. In his essay, architect Jan Olav Jensen approaches the Farm House as a case study house. Its qualities, he explains, arise from JVA’s working methods, based on versatility and a certain feeling for serendipity, together with the firm´s ability to improvise during the building process. The architects challenge the legal regulations and habits of the Norwegian building industry and thus designate the house as a site for architectural exploration, drawing on innovations and ”as-found” objects, giving the house and the surroundings distinct qualities. JVAs work in Norway and abroad ranges from housing to public buildings. This book documents the Farm House at Toten by presenting the total collection of the architect’s working drawings, technical specifications, and photographs.